I want to learn..... what would be the best way for a newbie? Qt or clutter? Which one would u prefer we do it with? i go try to learn this. The whole point of this, is to try and make some toys that we can play with. I suggested Clutter due to its feature set, the fact that it is exceptionally fast, and can run on embedded and on-screen devices, and that it's flexible without being over-bearing. 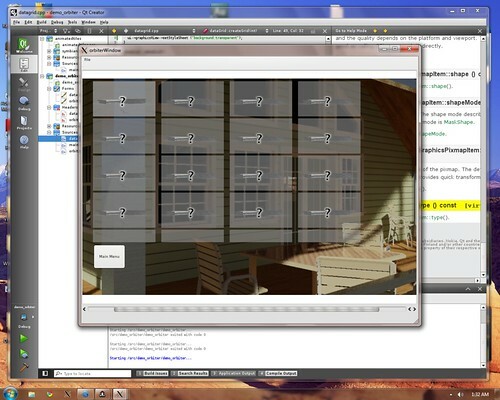 There is also the Mx toolkit which builds atop Clutter to create UI elements. But in the end, it doesn't matter what toolkit is used, because the whole point here is to get a "clay model" that we can use with our bare hands. should have something interesting as soon as i get scrolling implemented in a semi-interesting fashion. well that and cleanly laying out data grids Spent a few days trying to digest gui programming so far i have this...which a badly rendered grid. prototype 1st, refine later. 1. On the qt-web browser, has resolved and integrated most stuff(i think?) but im getting tripped up by one include. Says its a reference to an undefined function but i can find the function in the include thats in that file. confusing. I was looking around your code for a qt-web browser, and couldn't find it, to see what you were doing wrong. It's not there, but after thinking a bit it struck me what your problem might be. By your description your error is at link time, not at compile time. and run qmake to update your Makefile. This should get rid of your link error for qt-web, if I understand correctly and you use the QtWebkit stuff. Sorry forgot to list the link to it http://gitorious.org/linuxmce-webkitbrowser. Im specifically having a problem with a link against a function in a dcecommon. Me being the rocket scientist i am, I overwrote my my directory earlier trying to generate what I thought would be an updated DCEcommon lib to link against which would have the function. Long story short, i need to rebuild from from git(where i backed up my progress thank goodness) and then see exactly where the error was. I assume I'll have to go to my LinuxMCE development box, which is in fact Thom's development and girl amazement box , 'cause I get "Gen_Devices/QtWebBrowserBase.h: No such file or directory". That is if the Device Template is in the latest database. If it's just on your system, then I can't do much to help you, unless you give me direct access to your system to see what's going on. I've played a bit with QML on this. This is a start - for me - taking a bit of this and that from QML seeing how it operates. It is in no way a consistent UI, and more than likely breaks most paradigms. I've attached a deb for maemo as I've been testing this on windows and my N900. - a lot of the menu items do nothing but clicking on each unloads the current component at least if not loading its own component, at the moment. - touch arrow at top of screen - quick access area appears - can put status here, at the moment has quit button. attached deb updated - shouldn't depend on qtmobility. update 2: deb updated, more sensible name, scroll menu working. awesome. I will have to set up a maemo 5 SDK (if it's still out there), to test this. I do not have my N900 any more, as it was nicked in a hotel room.. I wonder if we could get some more targets built for testing? and why would we flame you for doing awesome stuff? Thom - sorry to hear about your N900 being nicked, not nice!! will try and get screenshots, though screencast would be better, tried one already but it wasn't smooth at all.